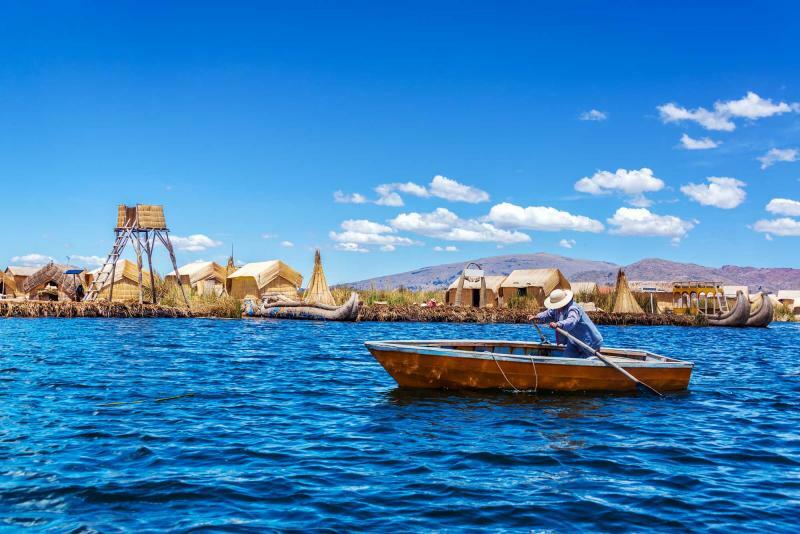 The sapphire water of Lake Titicaca brings effervescence to your exploration of Peru on this unique tour tailored to show you the country along the Andes. 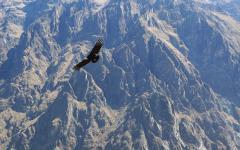 Condors glide above Colca Canyon. The cobblestone streets of Cusco echo along the walls of Spanish history. Machu Picchu stands tall above the Urubamba Valley. Whether in the luxurious lodges of the altiplano, mountain plateau, or in the urban comforts of Lima, explore the wonders of Peru, within the culture, within the food, within the ruins, and within you. Peru tours are sensational and this 13-day adventure takes you through the grandiose landscapes and cultural wonders of Peru. This Peru luxury tour is for amateur archeologists, llama lovers, cultural enthusiasts, tea drinkers, and those who have ever considered any of the above. The majesty of Peru will rise before your eyes; the rolling mountaintops of the Andes, the waters of Lake Titicaca iridescent in natural sapphire, and the vibrant colors of the indigenous clothing will fill you with joy as the Andean world bursts with life. Listen to the subtle sounds of the pan flute beneath the open mountain sky. Machu Picchu sits on the plateau as the City in the Clouds. 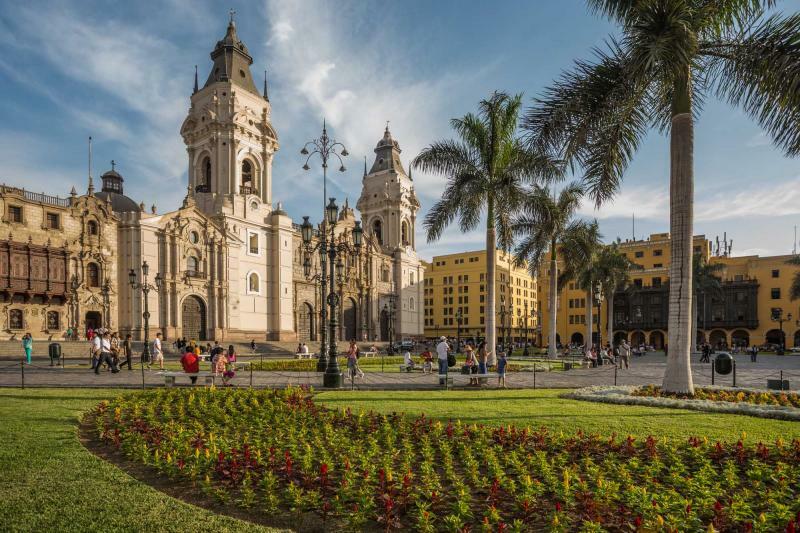 From the urban culture of Lima to the remaining wonders of Peru and its people’s history, journey deep inside the majesty that brings the country to life as you make your way along the custom tailored path into this eclectic world. 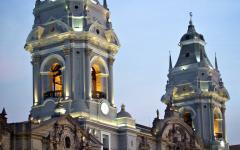 Begin your journey in the capital city of Lima where the urban luxuries are set within the city’s history and modernity. 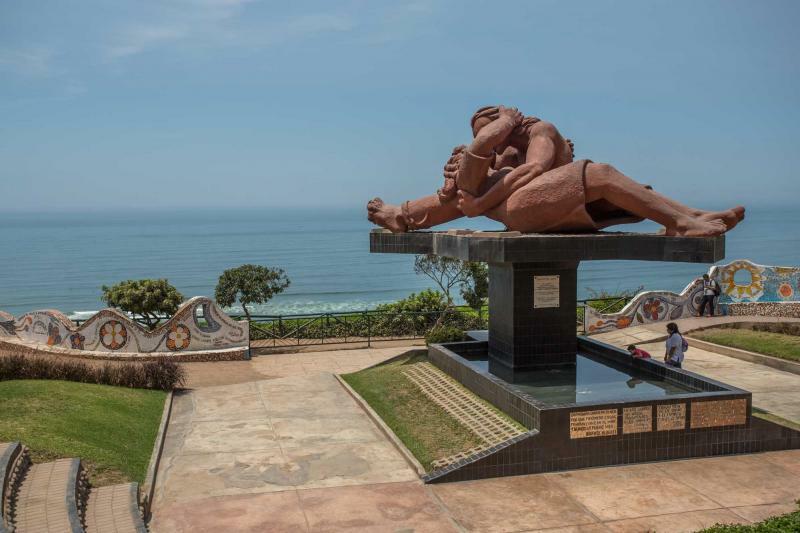 From the Spanish remnants in the city center to the upscale and posh neighborhood of Miraflores, your time in Lima is a perfect introduction to Peru. 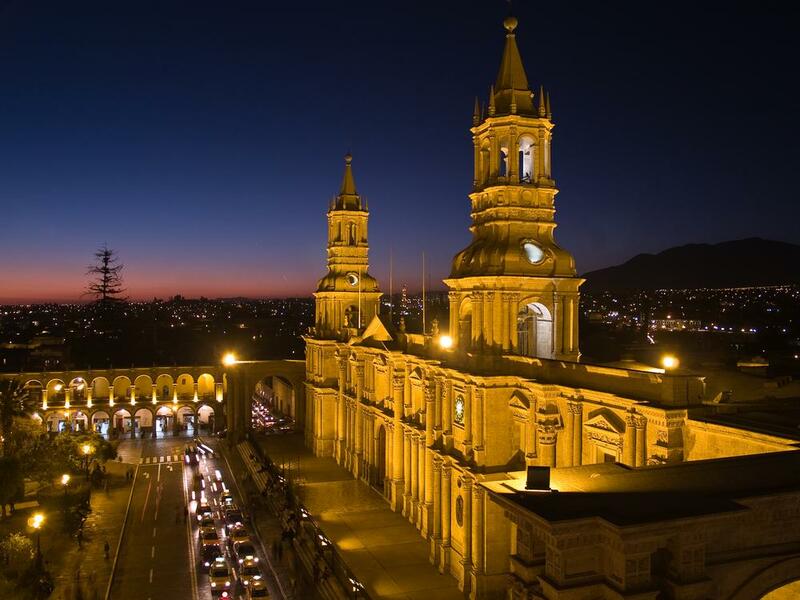 Travel from Lima to Arequipa high in the Andes where the streets and architecture continue to boast its Spanish connection, even though the culture of the city has always been connected to its indigenous roots. The city glows with white facades and the murmurs of mummies drift through the streets. Into the mountains you will find the unique view of high altitude villages and life within the plants and llamas that graze upon them. Settle into the luxurious comfort of Colca Lodge surrounded by the beauty of the second largest canyon in the world, Colca Canyon. 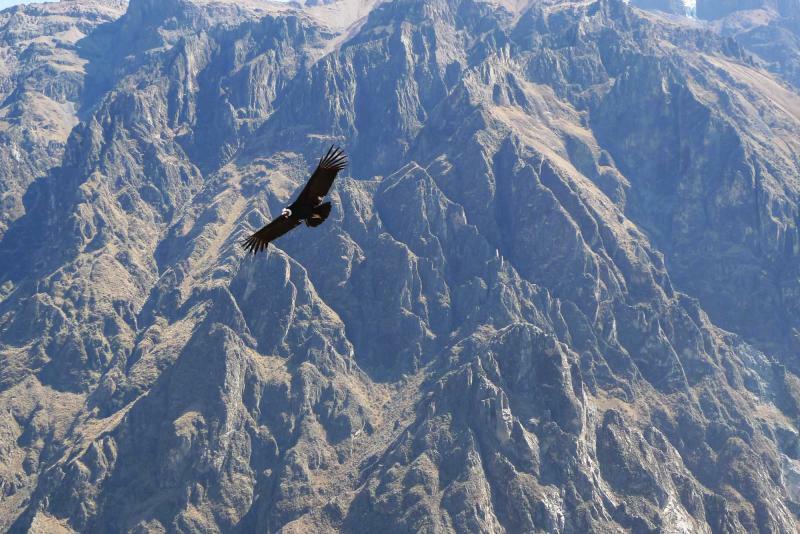 Witness the grace and elegance of condors as they soar through the sky around the area known as Cruz del Condor, Cross of the Condor. From the majestic beauty of Colca Canyon you will venture to the serene city of Puno along the shores of the famous Lake Titicaca. The water shines a fabulous blue as islands float along its surface. 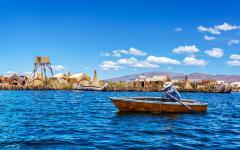 Enjoy a tour of the lake to see the floating islands and the fantastic stationary island of Taquile, known for its people and art. Continue your journey as you take the luxurious train into Cusco where the expanse of the Andes spreads into the horizon before arriving in the beautiful mountain city. Explore the majesty of the city from its unique architecture and culture, to the ruins that surround Cusco, including the hillside structure of Sacsayhuaman Fort. 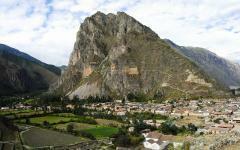 Let your heart pulse as you continue the journey of a lifetime and begin your tour of the Sacred Valley. The lush mountains stand tall around you as the Urubamba River rushes past. The valley is steeped in history, from the unique culture and people who have remained for centuries, to the ruins that are strewn across the hillside. 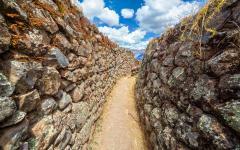 Enjoy the city of Chincheros as you wander through the ruins of the fortress Ollantaytambo. 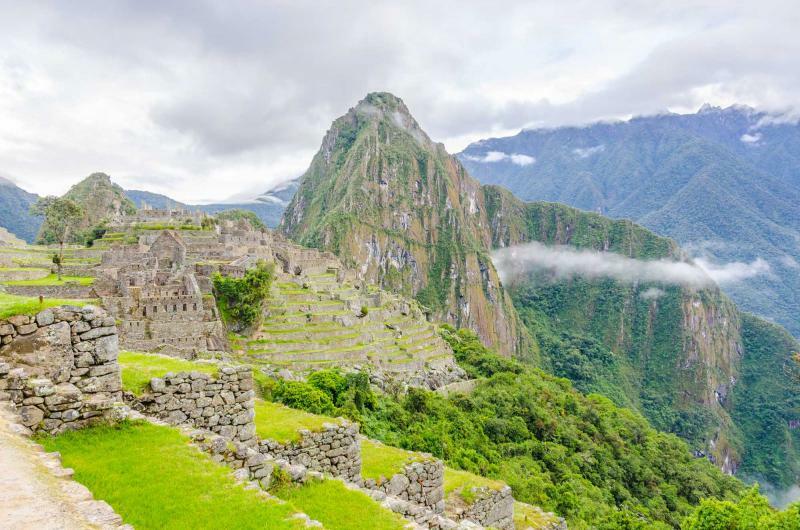 Explore the City of Clouds with your guide as you venture through the famous city of Machu Picchu. Whether sitting along the Sun Gate, exploring the bridge carved into the cliff’s side, or hiking to the peak of Huayna Picchu for a better view of the city below, the majesty of Machu Picchu is never ending. Briefly return to Lima where you will have the opportunity to dine next to a Peruvian pyramid before returning home. 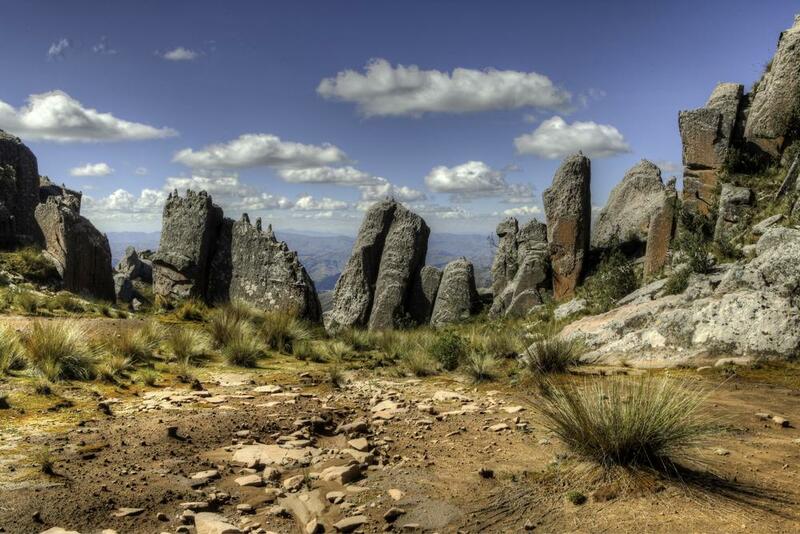 Atop mountains, sunken into valleys, and everywhere in between, you will discover the true magic of Peru. 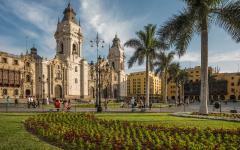 Arrive in the stunning city of Lima, the capital city of Peru. The center of the city is filled with gems to be discovered, from the wondrous architecture to the city’s conquistador past. The citrusy scent of fresh ceviche beckons to you. 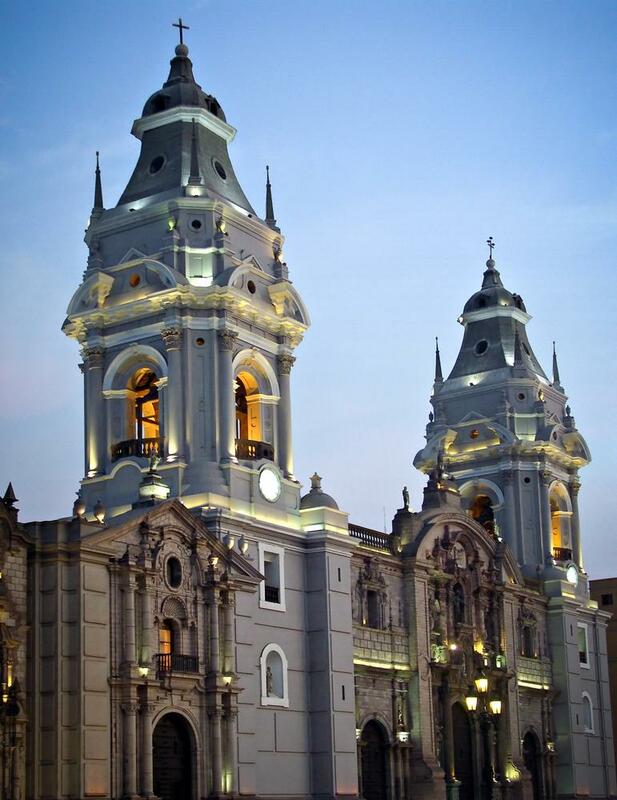 Tour through the city, on your own or with a guide, and experience the fabulous and vibrant life of Lima. The cathedral stands tall along the Plaza de Armas; spires rise high into the air with Spanish opulence on either side of the entrance. The bells chime on the hour and fill the square with music. Wander into Lima’s old train station, now a cultural center known to the locals as Casa de la Literatura Peruana, which means House of Peruvian Literature. The façade of the building glows yellow in the warm Lima sun. The white painted pillars stand out against the yellow and build upward towards the ticking clock. The interior shines with colorful stained glass, the variety of colors shimmering along the floor. Where once the scent of polished tile would linger along the station, now the rooms are perfumed with books that show the deep range of Peruvian literary works. Wander around and through the stunning architecture of Torre Tagle Palace. The palace is considered to be one of the most stunning pieces of architecture in South America due the unique elegance and grace of early 18th century styling. The coat of arms of José B. Tagle is still hung above the door as the pink façade stands out against the hues of the city. Two sensationally carved wooden balconies adorn the façade and flank the stone carved entrance. Venture inside to see the courtyard, styled like at Spanish villa, where wooden balconies wrap around the building and showcase the designed tile floors below. 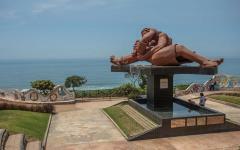 There is also plenty of time to visit Miraflores, one of Lima’s modern and majestic residential neighborhoods. The green of the grass and trees radiates against the blue of the sea. You can hear the gentle rush of the waves as they lap against the sand. The breeze brings in the sweet and salty aroma of the water. Visit the statue of lovers along the Calle de las Pizzas, where their comfortable embrace sits in stone forever along the shore. The morning brings with it the wondrous scents of rich Peruvian coffee and the delicious creamy texture of Lucama, a fruit indigenous to Peru. 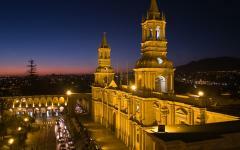 Relax in the comforts of the capital for a few moments before you are whisked away to the White City of Arequipa. 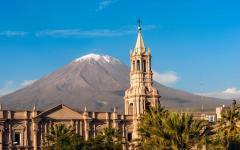 Arequipa is located high along the Andes, ridged on the outskirts of Colca Canyon, and is the second most populous city in the country. Acclimate to the altitude of Arequipa with hot cup of coca tea. Wrap your fingers around the warm mug and let the leaves seep into the water. The slight bitterness is a welcomed flavor and gives a sense of calm in the height of the city. 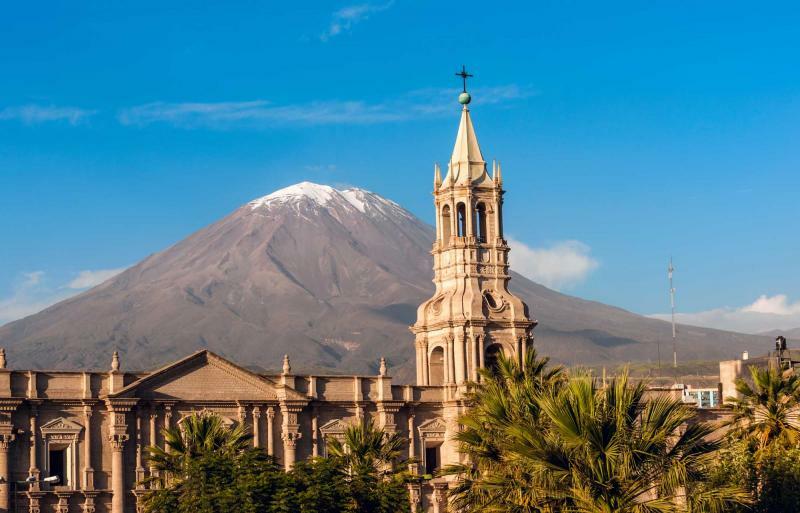 Arequipa is known for its stunning Plaza de Armas, where the architecture is pearled white and stands taller than the palm trees that decorate the square. The multi-tiered fountain rains and splashes in the afternoon sky. The cathedral stretches the length of the square with its spire almost dwarfing the trees. Made from sillar, a white volcanic stone, the pearl color is iridescent in the daylight and is illuminated by the light of the moon. El Misti, meaning the Gentleman, is the tallest of three volcanoes and whose silhouettes are visible behind the cathedral. Wander along the cobblestone streets of the city and find the Ice Maiden in the Andean Sanctuary Museum of Catholic University. Juanita, as she is known, is a well-preserved mummy discovered on the top of Mount Ampato almost 20 years ago. The museum is bright and active with people, from children to adults, curious about Juanita and the history of the region dating back around 500 years. As the sun begins to set over the city you can watch the white faces of the buildings along the Plaza de Armas become bathed in a luxurious orange glow. 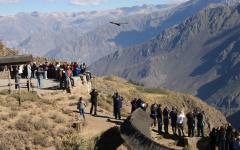 Today you will depart from the white glow of Arequipa’s architecture and into the wondrous sights of Colca Canyon. 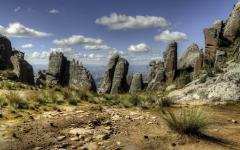 Wind through the peaks and along the ridges of the Andes, the largest mountain range in South America. Many peaks glitter with snow year round as llamas graze along the rocky landscape. The local men often where chullos, knitted hats with earflaps, to keep them warm in the cold conditions of the high altitude. Alpaca sweaters and blankets are sold in tiny wooden sheds along the route. The wool is soft to the touch, soft enough to feel smooth from every angle. Arrive and settle into the luxurious comforts of Killawasi Lodge. The thatched roofs and stone structure, along with the crisp fire warming the room, keep you cozy no matter the weather. The valley is flourishing with a green that would make the Jolly Green Giant envious. The mountains border the valley and roll into the sky. Dip your toes into the hot springs and relax into the warmth of Mother Nature’s Jacuzzi. The steam brushes against your cheeks. The water envelopes you and you will settle in easily to the comforts of its warmth. 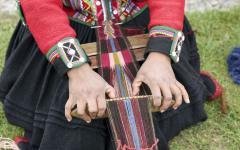 At dinner you can enjoy the local culture and cuisine, from alpaca steak to Quechua dancing. Indulge in the luxuries of Killawasi Lodge, the delicate richness of your dinner and the colorful clothes that swirl around the dance floor bringing the night to jubilant end. 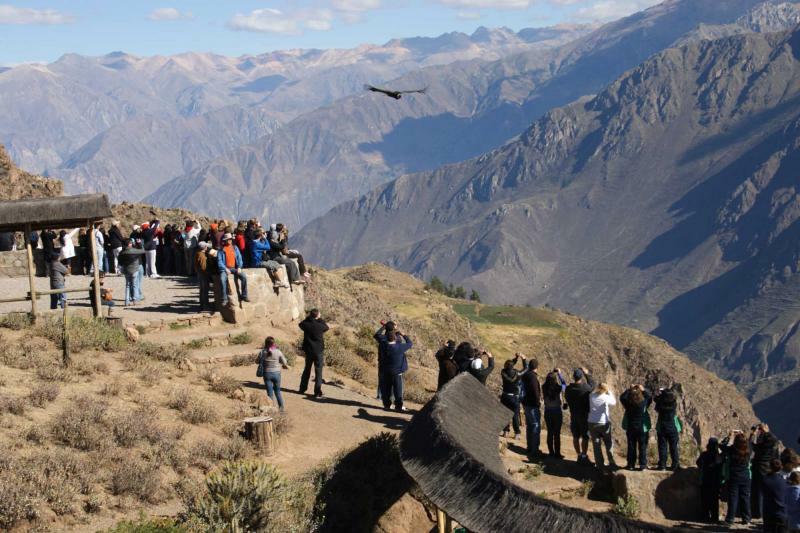 Venture outside of the lodge to see the incredible sights of Colca Canyon, the second deepest canyon in the world. From the fertile greenery that runs along the canyon-side to the sounds of the rushing river the rises from the depths of the valley, Colca Canyon is filled with immense beauty. The fog brings a gentle mist to the vehicle as you journey through the canyon road. The sun begins to burn away the mist and opens up the sky. Stop at Cruz del Condor, where a large cross sits off the roadway and marks the area for you to stop. The mountains are craggy and surround you. The valley is deep below you. Look into the air and watch the gentle gliding of condors, the largest flying birds in the Western Hemisphere. Their wingspan is impressive as they circle high above the mountaintops. As they swoop down into the valley you realize how large they actually are, how from a distance they seemed the size of an owl but they speed down to the earth and grow until their wingspan is as tall as you or the person standing next to you. Whether watching the condors drift through the air or visiting the local ruins and catacombs of the canyon, traverse the area and enjoy the continuous wonders before returning to Killawasi Lodge for a relaxing evening of decadent comfort. Today you will depart from the beautiful Killawasi Lodge and explore the scenery of the Andes on the way to Puno. The road winds along the mountains where clouds drift past and over the landscapes. The curious expression of the llamas decorates the roadside. Mounds of stones are stacked in the distance like balancing paperweights. 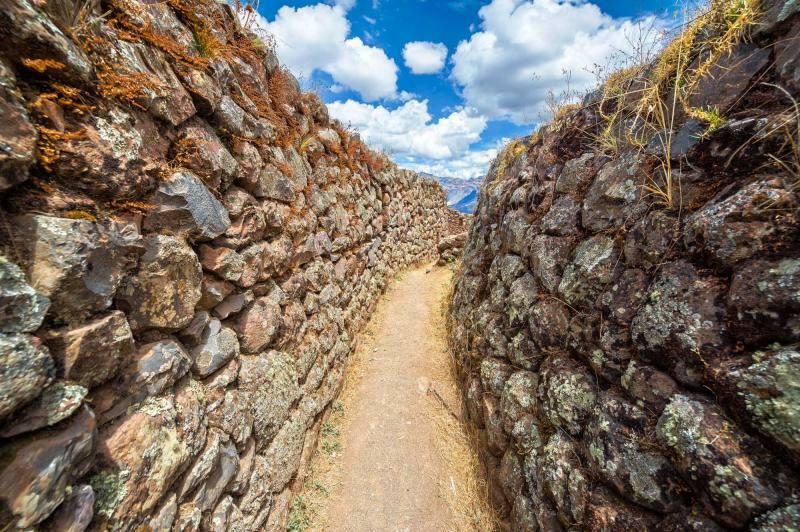 Enjoy a stop at the Sillustani Ruins, a pre-Incan burial ground near Lake Umayo. The large stones are stacked in cylinders creating chullpas, funerary towers often constructed for noble persons or families; Sillustani is considered to contain the best-preserved example. The quiet of high altitude plains sweeps through the air. Along the lake’s edge you can see the remains of the chullpas standing tall and cylindrical amongst the grass. The history sings with excitement as you can see the inspiration of Incan design within the remaining structures of Sillustani. Arrive in Puno and wind through the mountain road into the valley. The city sits on the shores of the largest high altitude lake in the world. Once in the city settle in to your accommodation. You can hear the boisterous markets and street venders along the main square. The cologne of fried dough drifts through the streets. Walk along the Plaza de Armas, the city's main square, where the life pulses through Puno. The town library, an art gallery, and the red stone of the 18th century cathedral wrap around the open square. Follow the crowd of locals down Jiron Lima, the main pedestrian roadway that leads to the Arco Duestua monument. Street vendors add colorful clothes and tasty treats to the roadside, shops line the buildings, and restaurants spill delicious scents of delicious flavors through their doors. Puno is open, joyful, and inviting. Begin your day with a delicate taste of Peruvian coffee, the aroma enough to liven the senses and bring you back to the beauty of Peru. Today you will venture onto the sapphire waters of Lake Titicaca and explore the largest high altitude lake in the world. The water is cold on your fingers, the mist cool on your face. The sun is bright in the morning sky. Enjoy the quite of the lake with your private guide as you drift into the large expanse of the water. 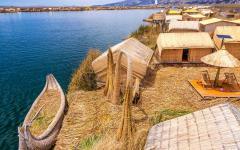 Your guide explains to you the coming attraction of the famous floating reed islands of Uros. Your boat docks along the island. Children dressed in the local indigenous clothing help you disembark. The girls’ shawls are colorful and soft. Their hats have large rims to keep the sun from their skin. Their blouses are fringed with detailed patterns sewn along the shoulders and encircling the buttons. The scent of fresh water and dried grass surrounds you. 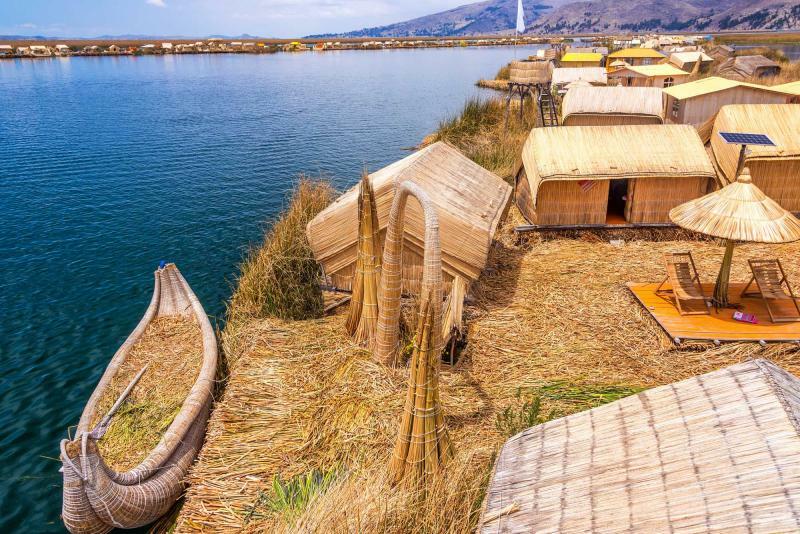 Follow the children and learn about the fascinating history and wonderful culture of the Uros who originally started floating along the waters of Lake Titicaca to avoid the Spanish invasion. Your journey around the lake continues with a visit to Taquile Island. UNESCO has proclaimed the Taquileños’ textile art “Masterpieces of the Oral and Intangible Heritage of Humanity.” Dock in the natural quay that allows small boats to anchor on the island. The stone walkway leads you up and through the main village of Taquile. The scent of garlic emanates from homes built from stone. From the top of the island you can see the expanse of the lake, the shores of Puno, and some islands on Titicaca that belong to Bolivia. The water glimmers beneath the warmth of the sun. The islanders are friendly and their garments, from sweaters and blankets, to beanies and socks are warm, cozy, and unique. As the sun begins to drift below the water you will return to Puno and settle into the evening. Today you will say goodbye to the shores of Lake Titicaca and the beautiful streets of Puno. Depending upon the day of travel you can climb aboard one of the top ten railway journeys of the world and make your way to Cusco. The train is nothing less than luxurious. The seats are comfortable and inviting. The windows are open to the magnificent landscapes that surround you. The dining car is filled with indulgent food and tasty libations. Sit in the warm cushions of the luxury car that feel more like Lazy Boys than seats on a train. Pass the incredible scenery of the alitplano where the grass drifts in the breeze and, because of the altitude, the mountain tops look like hills instead of peaks. Herds of llamas huddle along the plain. Villages decorate the mountainous expanse. The dining car takes you back to a time of decadent train travel and wondrous exploration. The car is scented with the rich and salty flavors of Lomo Saltado, a stir-fry of beef, tomatoes, peppers, and onions blended into a pan with soy sauce and fried potatoes. 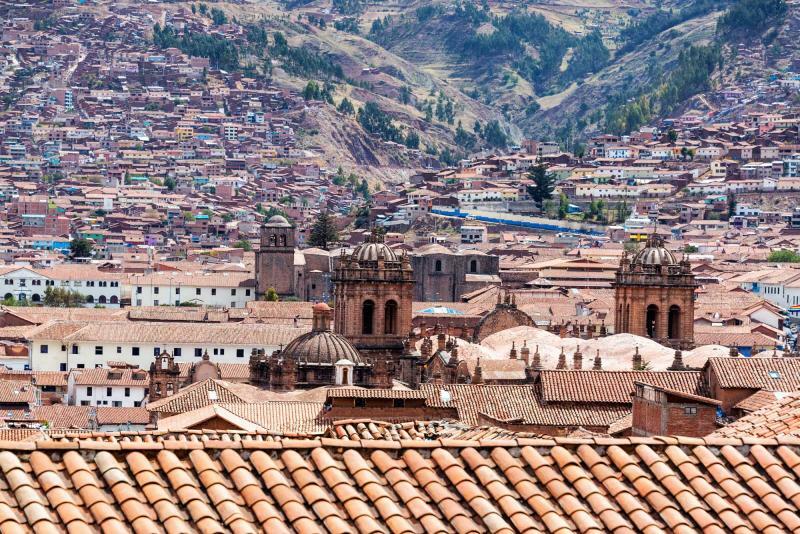 As the train pulls into the beautiful city of Cusco, you may not want to leave. 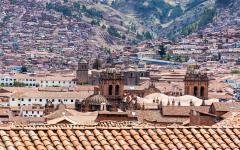 Today is at your leisure to explore the fabulous sights of Cusco. The Spanish influence is prevalent within the city’s architecture; however, the food and culture of the city is a blend of the once populated Spanish and the strong, resilient cultures of the indigenous people of Peru. The streets are cobblestone, lined with multi-storied buildings that shine yellow, white, pink, and blue. The Plaza de Armas is always filled with people where the impressive cathedral casts shadows on the square. Cafes bustle with locals and visitors alike, the musk of fresh coffee and citrus fruits drift through the open windows. 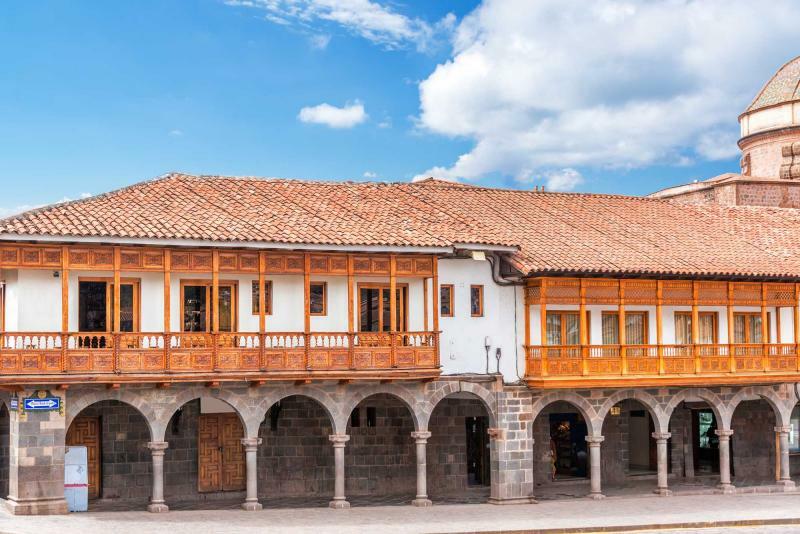 Whether visiting the ruins of Sacsayhuaman Fort that stand on a hill overlooking the entire city, or wandering along the narrow streets to see the local shops and culture of the city, Cusco’s sights are never-ending and always joyous. Every day the central market is chockfull of local vendors selling vegetables, meats, fruits, and the like. If you enjoy local food and culture visit the central market around noon to see the hot food stations bursting with life. Each restaurant has a menu and corresponding seats along the long benches. If you don’t feel like sitting along the bench you could always order to go. The roasted chicken is famous for its juicy meat packed with flavor. Continue on to San Blas, the local bohemian neighborhood. The streets leading to Plaza San Blas are a bit steep but offer a stunning view of the rooftops below. 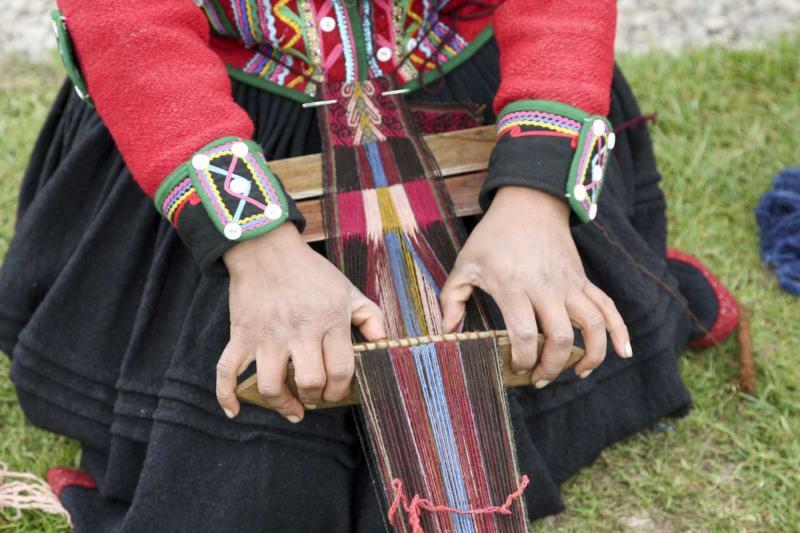 From unique paintings to textiles, San Blas offers the beauty of Peru immortalized in the art of Cusco. The sun rises over Cusco and you can imagine the glow of the morning sun as almost touchable due to the altitude of the city. 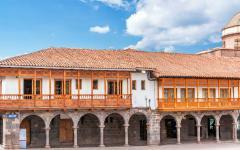 Depart the splendor of Cusco and pass the fantastic ruins of Sacsayhuaman. A decisive battle between Incan rebels and the Spanish army was once fought along the mountain ridges and within the fort itself. Enter the Urubamba Valley deep within the canyon along a once prominent Incan road. The valley floor is patterned with fields and rimmed by vast terraces of farmland climbing up the mountain walls. 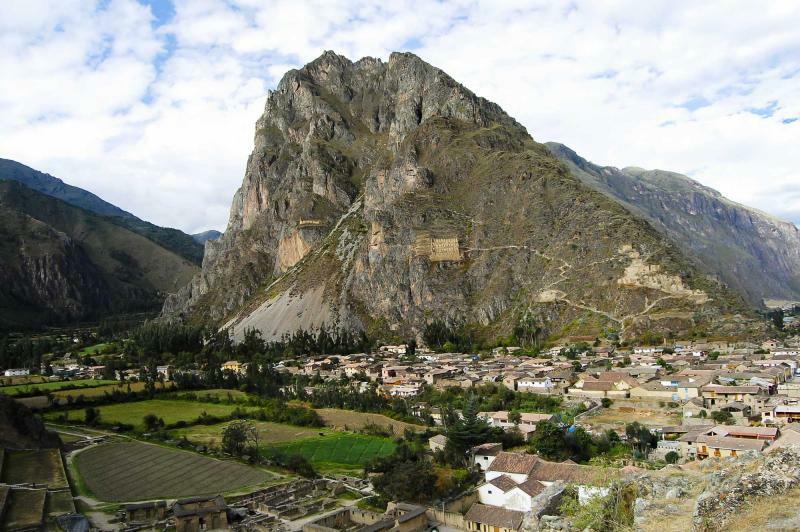 Arrive in Pisac to witness the ruin stonework, along with the panoramic view of the Inca stronghold. The stone still sparkles with morning dew. Terraces, water ducts, and steps have been cut out of solid rock. High above the excavated ruins hide secrets and gems of rocky overhangs and ancient burial grounds. Modern Pisac is a typical Andean village with a pisonary tree, once sacred to Incas, embracing the central square. The central market remains charming and local with the scent of fresh fruits and vegetables drifting through the open space. Villagers travel for miles to gather, barter, and sell their produce. Whether exploring ruins or culture, your time in the Sacred Valley has just begun. The morning dew lingers on the fertile countryside of the Urubamba Valley. Venture out of Pisac along the lush radiance of the morning mountainside and down into the valley to Ollantaytambo There is debate about Ollantaytambo’s original purpose however many archeologists believe the Incas built it as a fort that included a temple, agricultural terraces, and an urban area. The walls and towers continue to stretch along the plateau and the mountain. The tiers climb up the mountainside, accessible by a single set of stairs, where the view of the valley below stretches into the distance. You can follow the traces of ancient roads and aqueducts that flow down the slope into the valley. The journey continues into the Urubamba Valley where you will arrive in Aguas Calientes, known for its spas and hot springs. The Urubamba River rushes along the sides of the city and through the incredible foothills of the mountains. 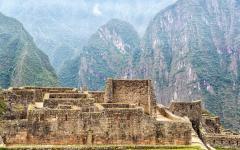 It is a quick journey to the entrance of the fabled city of Machu Picchu. Follow your guide on a sensational walking tour through the ruins. It is almost like a storybook or an image from Indiana Jones. Huayna Picchu’s peak lingers in the sky ahead. The surrounding mountains undulate along the horizon. The rush of the Urubamba River has disappeared. The scent of fresh grass and damp stone rises from the earth. 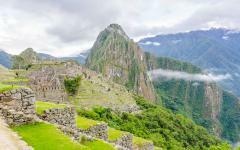 Your guide explains the majestic history of the Incas and the city in the clouds. 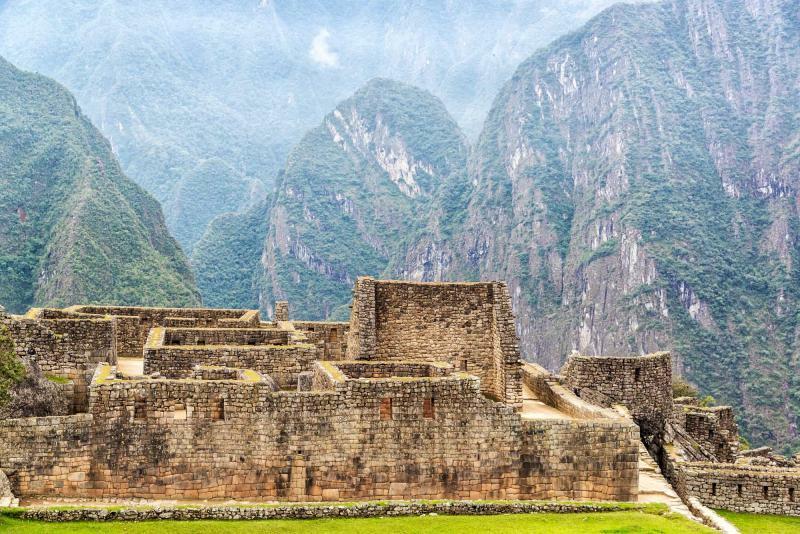 Walk up the Inca Trail to the Sun Gate where the city of Machu Picchu can be seen through the remains of the temple. 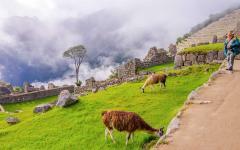 The plateau often gives those that choose to trek the Inca Trail the first glimpse of Machu Picchu at sunrise. From the temple’s remains to the variety of quarters and tiers, Machu Picchu is a city unlike any other, built along the mountaintop. Return to Machu Picchu with the sunlight barely peaking over the mountaintops. You will have the ruins virtually to yourself to enjoy a full-guided tour of the city. The clouds hover over the ruins. Your guide takes you around the stone walkways and through the history of the temple and possibly over the Inca Bridge, which is part of a mountain trail that heads west from Machu Picchu consisting of a stone path, part of which is cut into a cliff face. There is always time to climb Huayna Picchu, the towering peak that casts a shadow on the city. With only 200 visitors allowed on the Huayna Picchu trail per day, the experience is always unique and completely personal. Part of the trail is structured with stone stairs smoothed by wind and rainfall. The balancing rope strewn along the mountainside is course in your hands as you climb the sometimes-steep path. There is nothing better than reaching the tip of Huayna Picchu and looking down on the City in the Clouds from above, feeling as if you have surpassed the clouds all together, as if you stand in the highest depths of the sky. The city and people below are dwarfed, the air is crisp and pure, and the Urubamba River snakes though the valley in the distance. The clouds drift, the sun shines, and you make your way back to Aguas Calientes, as ready as you can be for your return to Cusco. Today you will make your way to the airport after a brief stop in Lima before your return journey home. Spend the morning before your departure winding along the cobblestones of Cusco one last time, memorizing the tiny alleys and vibrant galleries. Once in Lima you can enjoy a unique dining experience beside a 1,500 year-old pyramid. The decadent treats on the menu range from quinoa and corn dressed with green beneath succulent beef medallions, to fried yucca and lomo soltado, a Peruvian stir-fry. The salty crunch of the yucca and the grainy richness of the quinoa are enough of a reason to visit Huaca Pucllana; however, mixed with the scent of history from the architectural site, the experience is as unforgettable as Machu Picchu itself. After dinner you will make your way to your flight and wave goodbye to the delicacies, comforts, luxuries, and majesties of Peru, and say hello to home, never forgetting the depths in which you explored the history and culture of this country, as well as yourself.